This is a famous Irish surname of great antiquity. It is recorded in at least seventeen spellings including: Houlaghan, Hoolohan, Holohan, Holian, Houlahan, Houlihan, Hanalan, Oolahan, Woolaghan, Whoolehan and even sometimes in County Clare as Holland, in Roscommon as Nolan, and in Kilkenny as Merry! However spelt the origination is the pre 10th century Gaelic O' hUallachain, which translates as the male descendant of Uallachan, a personal name meaning proud and arrogant. Two distinct septs of this name arose in Ireland, one in County Offaly and the other in Thomond, an ancient territory comprising most of County Clare with adjacent parts of Counties Limerick and Tipperary. 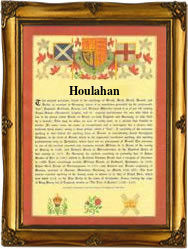 In due course the septs spread southwards, and several members of the sept today residing in Munster spell their name Houlihan, Holland or Nolan, the latter two forms resulting from confusion over the original Gaelic form of the name in 17th Century records. In the 1659 census the majority of namebearers were recorded in County Kilkenny where Holohan is the most usual present day spelling, although synonymously with Merry. In a pardon of 1558 one, Richard Merry, alias O'Howloughane, was recorded in County Kilkenny. The first recorded spelling of the family name is shown to be that of Donal O'Hoolahan, the Archbishop of Cashel. This was dated 1171, in the "Ecclesiastical Records of County Tipperary", during the reign of King Rory O'Conor, last native High King of Ireland, 1166 - 1175. Throughout the centuries, surnames in every country have continued to "develop" often leading to astonishing variants of the original spelling.